"but those who hope in the Lord will renew their strength. They will soar on wings like eagles; they will run and not grow weary, they will walk and not be faint." Isaiah 40:31 The cross is impressed with pine needles. Evergreens like the pine are associated with everlasting life and the source of our eternal blessings. "I am like a green pine tree; your fruitfulness comes from me." Hosea 14:8 The flow of circles form a path, symbolizing our faithful journey with Christ. This #2 is a variation on the original that was commissioned by St. John's Lutheran in Cypress, TX. The eagle is my 3 dimensional interpretation of the church logo. This variation shown as #2 has a horizontal cross arm that measures 1/8" shorter and the impressions are a bit different in comparison to the #1. Both versions are available to order. 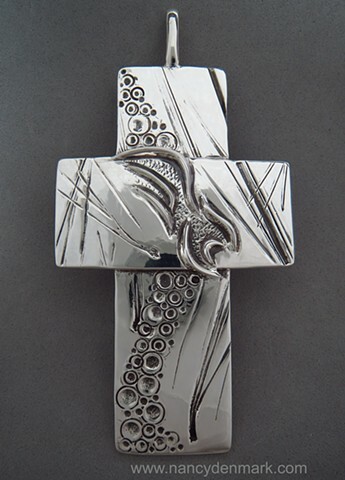 A new small cross is now available with the eagle raised on a high polished cross.